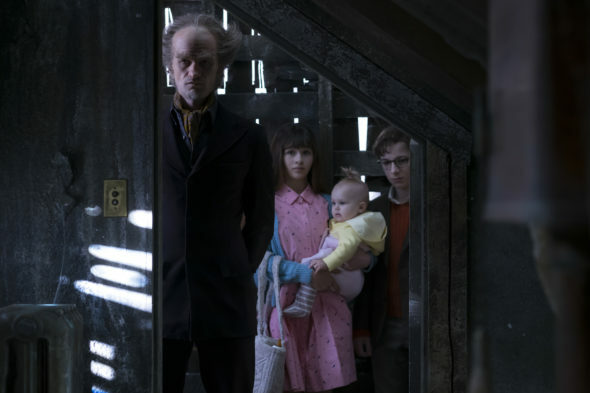 Based purely on nostalgia for some of my favorite books when I was a kid, Netflix’s A Series of Unfortunate Events was primed to be one of my favorite series of 2017 before hitting the site last week. This also extends to most of my friends – all of whom are children who grew up with the plight of the Baudelaire orphans at the hands of Count Olaf. Bringing back a highly successful children’s series that crossed over to adult themes (I mean, their parents are dead within 10 minutes of the show/book beginning) seemed like a complete layup. And yet, watching the Netflix adaptation has proved that this is one of the most delightful shows one could find currently. The series was last adapted for the screen in the 2004 movie starring Jim Carrey as Count Olaf. I remember enjoying this movie when I saw it, but then again I also enjoyed Elmo a lot in 4th grade, so I can’t quite say I was a proper critic at the moment. The truth after watching the front half of the series is that this is a show that thrives on our current model of television. A film to cover three books, let alone three fairly rich in detail. seems perilously thin. Two episodes for each book? Now you’re talking. It lets the story breathe just enough and allows for the series to shift in some major ways. I would again caution that I can’t claim to be an expert on the series anymore, as the last time I read one of the books in full was easily in the Bush presidency, but some of the chronology of the series has been adapted to make the television show compelling. There are big mysteries at play here, and while they are not revealed until much later in the books, they are roughly in play from the first episode. Answers aren’t clear right away, but they are at least getting the ball rolling enough to have viewers buy in. However, any and all consideration of the show must also include that Neil Patrick Harris is here and doing NPH things, which makes me inclined to give him a Limited Series acting Emmy eight months in advance. His Count Olaf does a lot of the heavy lifting on the show, moving between moments of legitimate malice, blatant fourth wall breaking, and the comedic timing that made his Barney Stinson a sitcom legend. His performance may not be mesmerizing in the same way that Courtney B. Vance’s Johnnie Cochran was in The People vs. OJ Simpson, but fans of NPH are going to be very, very happy to see him here. This is far from a perfect show. I make no illusions that there aren’t confusing moments or dragged out sequences, but I’m not sure that’s all that important here. Part of this show’s story is telling the story of the orphaned Baudelaire children, who are also fairly well acted by Malina Weissman and Louis Hynes, who see the world as a confusing mess given that their parents, you know, just died. Patrick Warburton stands in for Lemony Snicket as our narrator for the story and makes the mess a bit cleaner while being semi-hilarious the entire time. The show is a bit scatterbrained and can get tedious in moments, but never enough to detract from the enjoyment that comes with revisiting the series again. Will the show be an Emmy contender come year’s end? Likely not. Will it be one of your favorite things you watch this year if you liked the books as a kid? Likely yes.